In a previous post I introduced you to several cases of people accidentally buried alive here in the United States and the fear generated by such burials. For the sad souls who were accidentally buried before they were really dead, by the time the mistake was discovered it was too late to save them. 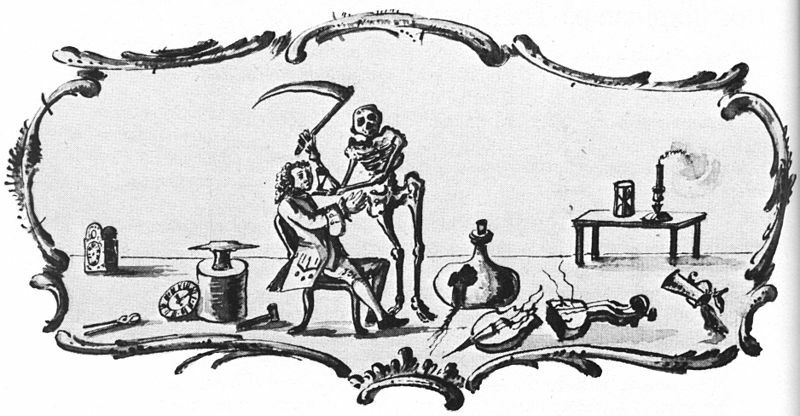 There were quite a few fortunate ones who had near-misses with being buried alive, particularly before the widespread use of embalming techniques. Such cases involve someone being declared dead and prepared for burial when they “came to life” just in time to avoid waking up in a coffin underneath six feet of soil, dead to the world. 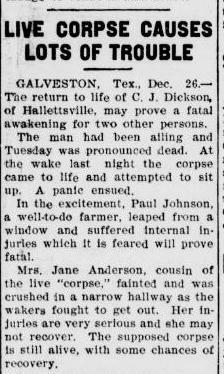 Newspapers often referred to such people as “supposed corpses” and used terms like “suspended animation” and “trance” to describe the condition of the person at the time he or she was declared dead. There are numerous accounts of people who have almost gone to the grave while still alive, here are just a few. Here’s one final example from Eatenton, Georgia. Fanny Warren almost broke completely through her coffin’s lid, scaring her mourners in 1911 and sending them fleeing from the scene.2 If I had been there, I probably would’ve hauled freight away from the body too, unless I was too paralyzed to move. Of course, catalepsy is one reason why people were buried alive so hopefully my legs would function properly. While there is no doubt that there were people buried alive and almost buried alive during the olden days, some accounts are questionable. Certain details leave open enough room to wonder if perhaps a few of these tales could have actually been related to the natural biological processes associated with death. The article, “A Sigh From the Coffin”1 claims that Mme. Pessat of France was a case of “living burial.” The fifty-year-old died and two days later at the grave mourners thought they heard a sigh from within the coffin. While some insisted that she was still alive, she never again showed signs of “animation” and an hour later she was again pronounced dead. If the only proof of her being alive in the coffin was the sighing noise, that sound could have been attributed to gases escaping through her mouth.